The Weakest Link is a game invented by TDAA judge Tara Choate for a TDAA judging assignment. The objective of The Weakest Link is to score as many points as possible in the allotted time. Only “banked” points will count toward the final score. Small dogs will have 60 seconds to accumulate the best score possible; big dogs will have 55 seconds. From the start each obstacle taken by the dog must be worth as much as or more than the previous obstacle taken. 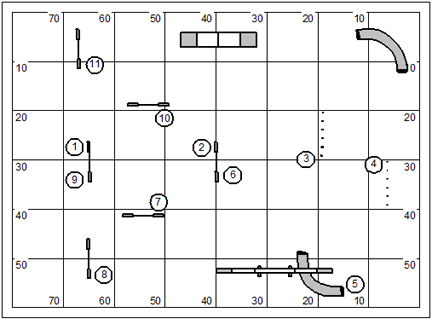 The dog’s potential score will increase as each obstacle value is added to the overall total. Points earned for the performance of obstacles earned will be credited to “potential” points. But the dog can’t keep or count on these points until they are “banked”. Points are banked when the dog does the tire (the banking obstacle). When the dog banks his points they are kept secure toward the final score and cannot be lost. When points are banked the potential points score is set to zero. After banking points the dog and handler team start over (beginning with a lower value obstacle if desired) so long as time remains. Each sequence banked must be unique. That means there must be at least one difference from any sequence previously banked. When a dog faults the judge will call “fault”. The handler is obligated to direct the dog to the first obstacle in a new sequence to earn potential points. If a bar is dropped on a jump, that jump is out of play for the remainder of the game except when that jump is in the gamble sequence. Every attempt will be made to reset the bar on a gamble sequence; if it has not been reset, the dog must be directed between the standards of the jump. Gamble ~ double the usual value of the obstacles in the gamble (so this gamble, will be worth 36 points). 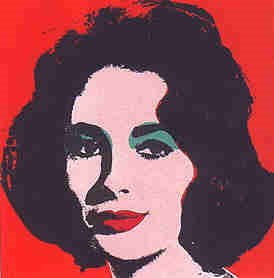 Who is the artist of this portrait? Who was the subject/model? I have a rather late flight out of Denver this morning. So it’ll be all day waiting in airports or being on a plane. I’ll get home I reckon about midnight. It’s been a long stretch for me having been away from home over half the month on various commitments. I know my chores have stacked up on me. July is a more laid back month. We usually don’t plan much in the most intense heat of the summer. But I do have scheduled in the month a work/study camp. I think I have only three or four people scheduled to come. So the format will be four hours of work in the morning and four hours of agility play and training in the evening. 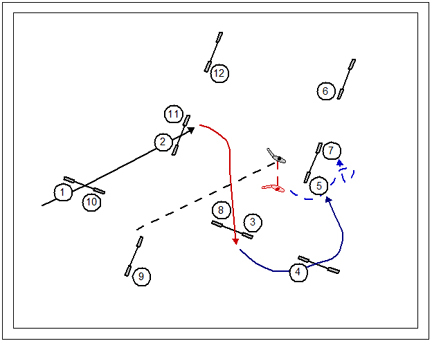 We might actually run this visa reversa just so we can do our agility work when it’s cooler. We’ll see how that goes. We came up with this idea as a response to a worsening economy in which a lot of agility people have been hurting. And we wanted to make available an option that lets them come out and play. Trust me I place a high value on the work because it’s entirely more than I can do anyhow. I’m looking at all the work I have to do to get ready for a “work camp”. It’s kinda like how you tidy and straighten up things in your house before the cleaning lady comes in. With the tough work I have scheduled I have to get supplies and tools all ready, tractors and trailers cleaned up and ready. Yah… I have about a week’s worth of work to do just to have things ready for my agility crew. WHO: Bud Houston’s offering a work-study agility camp, all levels. KIDS are welcome !!!! WHAT: Help us out with chores (painting, string trimming, sweeping, etc.) and earn agility training. Four hours of work earns you 3 hours of training plus unlimited use of the equipment during evening hours. Accommodations included for free, on-site cottage with complete kitchen and dog yard. WHERE: Southeastern Ohio, 20 minutes from Marietta and Parkersburg, 40 minutes from Athens, an hour from Zanesville, an easy drive from Cleveland, Cincinnati, Pittsburgh, Morgantown. WHY: We need help with chores, folks need help with agility. What could be simpler? Contact Marsha at marshahouston@hughes.net for details … flexible arrival / departure dates available, you may commit to 1 day, or all 5 days!! The TDAA trial at Rocky Mountain Agility was a boatload of fun. What a nice bunch of competitors and enthusiasts. There were a number of very nice dogs. As a community they showed quite a bit of growth in terms of their handling skills and the training foundation for their dogs. I’ve been watching agility competitors in the Denver area for about 20 years now. I was after a couple of them to make the trip to the TDAA Petit Prix this year. Colorado should be represented! Oreo and I turned in a clean round with the fastest time of the day (just a nudge over 19 seconds). It was very fun and literally no time for thoughtful or slow movement. Somebody remarked to me after that after my verbal release at the start line I didn’t say another word to the dog. It was all handler pressure with a bit of help from a dog that didn’t really need the micromanagement of “naming” all the pieces of the work. Somebody said they video taped it and promised to send me a copy. Maybe I’ll figure out how to put it up on YouTube so I can share with you all. I did a couple things different on this course than anybody else. The opening curve of five jumps is a complete illusion of course… It’s really two distinct lines comprised of the first three jumps and joined to the last two. 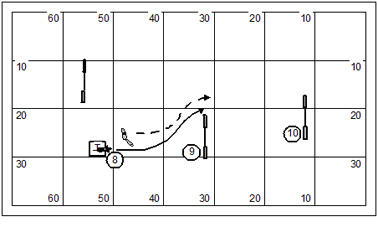 So I led out dog-on-left past jump #3 and did a quick Blind Cross in the turn to jump #4. I knew the Blind Cross was risky but I was going for the quick kill (rather than survival). And it worked out. In the 10-11-12 pinwheel I sent Oreo out to pick up #11 while I faded to the landing side of #12 for a layered Front Cross. I’d observed that handler’s (who weren’t doing gratuitous fast dog handling) would put pressure towards the collapsed chute while stepping in to do a Front Cross between #11 and #12. So I just avoided it altogether. And by layering for the Cross I put ample pressure on Oreo to turn back. Man that was a lot of fun. 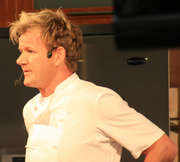 What is name of the restaurant chain started by this fellow? I’ve long maintained that play in the TDAA will improve the skills of the small dog handler. The short transition distances between obstacles literally requires the handler to have the same kinds of skills and timing as the big fast dog handler must have in the big dog venues. Look at it like this… it’s the pace of the music. If there are 10′ between the jumps the quick little Corgi will be three strides in the line and 5 in the turn. If there are 21′ between obstacles the same quick little Corgi will be 7 in the line and 9 in the turn. I don’t really care how fast your little dog is. It’s a huge jump to go from the band that plays a slow-tempo waltz onto a dance floor where they’re playing a quickstep. What happens to us in competition is what I like to call the $20 a minute lesson. Any fault and foible or even wobbly moment is simply information. It is a test both of the training foundation you’ve put on your dog and the execution of your canny handling plan. What did you learn in your lesson? This was the opening to my Superior standard 2 class yesterday. By my own reckoning I pretty much set up a sweet little slam into the pipe tunnel from the opening. 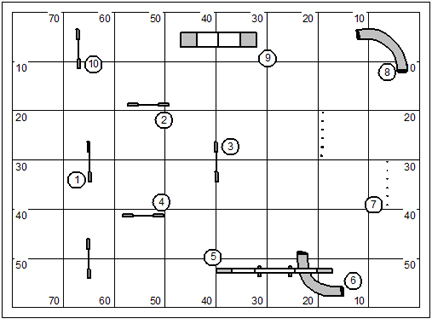 I figured the riddle was more of a test of the handler’s rear cross (if the dog is quick) at jump #5, as the course veers right after jump #5. I was ultimately treated to an analysis of how the handler managed the two tricky turns between jumps #1 and #2 and between jumps #2 and #3. As you can see if the turn between jumps #2 and #3 goes too wide the dog’s path will swing around to bring the A-frame into focus rather more generously than the pipe tunnel. Anything that actually works is right (that’s what I always say). So if this plan works for you, then bless your pointy little head. But don’t you know… there are times when something just a teeny bit different will actually work better. I know some of you saw this right away and put up with my teasing about handling the two turns in the opening line of jumps. Yep… you had your $20 a minute lesson on this a long time ago. The opening is a straight line and, as I had intended, a simple slam dunk into the pipe tunnel. The Intermediate standard class was carefully nested with the Superior. You’ll note that I rotated a couple jumps in the opening so that the opening line should have been easier to see. (I rotated the jumps myself and muttered to myself as I did so “this’ll make it easier for them to see”). Then, I’ll be darned if the first two handlers who approached the line squared their dogs up with jump #1 and earned a wrong course to the table after jump #1. Too bad I used the title “Just Shoot Me” for my blog a couple days ago. I could use it again. Eh? I had dreams last night. And I wanted to write it down while the images and impressions are still with me. My weblog seems like a good place to do it. It was nothing more than watching a woman run her dog. She was the amorphous could-be-anybody handler and the dog was a fuzzy dark blur. I watched the same run over and over again and it was nearly in slow motion. There are two bits that I still retain (you know how details in a dream will fade away from you after you awake); In the first part the handler is moving forward intent on a send forward. As the dog surpasses her position she’s putting on the brakes in her forward movement and swinging back with her inside arm (to point in exactly the opposite direction she’s trying to send the dog, mind you). And I can feel the dog in the dream curling back to her, as the handler’s cues manage to produce exactly the opposite effect as intended. In the second bit the dog is working a magnificent distance from the handler and must make a tight wrapping turn towards the handler. The handler’s response (from this magnificent distance) is simply to turn her body to face the direction the dog needs to turn. Meanwhile the dog casts out in a huge inefficient arc and is slowly enticed out of obstacle focus (magnificent obstacle focus, mind you) by the growing realization that the handler has turned her back on the work and is giving some vague cue for performance while doing so. I’m pretty sure it was the Fettuccini Alfredo I had for dinner last night. I adore a rich white sauce; but you know it doesn’t always sit well over night. So a tinge of heartburn pushes me out of deep and restful sleep into that state of near awake in which I become easy prey to dreams and haunts. 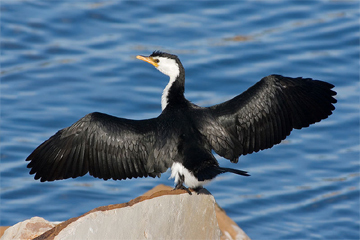 What is the common name of this bird? I got to attend an agility trial not long ago that demonstrated all of the usual foibles of a recreational sport. You know… the thrill of victory and the agony of defeat, that kind of thing. It’s a lot like watching a movie that sometimes makes you laugh and sometimes makes you cry. But this movie had a sound track! Bear with me here. I’m thinking that if a handler/dog trainer subscribes to a system of anthropomorphism in which the dog is as often as not an evil little imp waiting for the ripe opportunity to embarrass his person then the handler/dog trainer is spared the uncomfortable intelligence that his choice of movements to direct the dog failed or that it failed four frigging times. That’s right. Just blame it on the dog. The silver lining to this cloud is my firm belief that all dogs engage in a process of compensatory learning. That means a dog will learn to understand his person’s cues no matter how weak the signal, counter-intuitive the advice, or wildly flailing the arms. I don’t mean to bust anyone’s belief bubbles, but if my theory here is true then it means that the dog is an ardent and devoted student and isn’t invested in embarrassing or blowing off his person at all. Do me a favor if you will. If I ever come off the course saying that my dog “blew me off”… then just shoot me. Okay, I’m in Denver (Arvada, actually) where I’ve just finished two days of handling seminar for a wonderful group of people; and I’ll be staying two days more to judge a TDAA trial. I want to tell you that Zona, my host, cooked up for me the best enchilada dish that I’ve had in about 20 years. Certainly I’m not getting a wonderful enchilada at that Mexican restaurant in Marietta, OH (a long way from the Rio Grande mind you)… but best in 20 years is quite a distinction. She actually tucked a chile relleno inside of the enchilada. It was delicious. Okay… I have work to do before I go to bed. I need to do some TDAA course reviews. I have to work double duty when I’m on the road. What’s the second rule of Agility Boot Camp? The first rule of Boot Camp is… no fast dog handling. That means I’ll insist that the handler find a way to place all of his movements forward of the dog and pulling. The dilemma will be how to get this done with a truly fast dog? 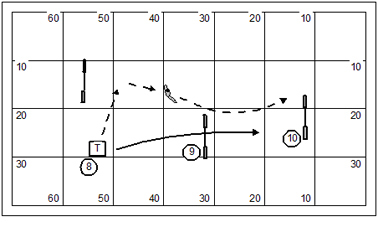 In my teaching I spend considerable time with how to make a speed transition. That means slipping from slow dog handling into fast dog handling; or visa reversa as the case might be. The conditions that dictate a speed transition will either be that either the dog has surpassed the handler’s position while doing slow dog handling or the handler has gotten in front of his dog while doing fast dog handling. But there you go. The first rule of Boot Camp says that we won’t be making any speed transitions at all. The handler will find a way to stay forward of the dog. Don’t get me wrong here. There’s nothing wrong with fast dog handling at all. Indeed, it is a necessary tool for… the fast dog. My students must solve the intellectual puzzle and learn to attack the course. We will not fall into the lines of the fast dog handler just to be lazy or slothful. Oh this seems such a departure from the distance curriculum that we’ve had to endure for the past six months or so. Now in a sudden paradigm shift we have to learn lickety split how to be a savvy and keen technical handler. So here’s the first puzzle of the day. For the handler of a truly fast dog coming out of a Front Cross between jumps #2 and #3 forward of the dog enough to put in yet another Front Cross between jumps #4 and #5. 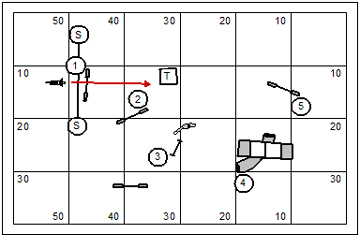 Now, try to imagine one more Front Cross between jumps #10 and #11. The question is ever, how does a human beat a dog in a foot race? The truth of it is… we cheat. Absolutely even with a good cheat in this sequence the handler will be racing the dog. But we’ll have to use the available real estate in prudent manner calculated to get there handler where he needs to be when he needs to be there. 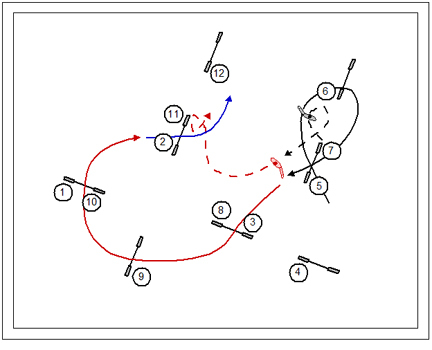 The opening cheat is a parallel path lead-out. The handler shifts to the side to take a line perfectly parallel to the dogs. This is a know-thy-dog kind of opening. The handler needs a pretty good grasp of how far forward on his line he has to be before giving a release to the dog. This is not a lead-out that will allow the handler to stop at any time because the forward movement is what communicates the opening line to the dog. If the handler stops the line goes away. 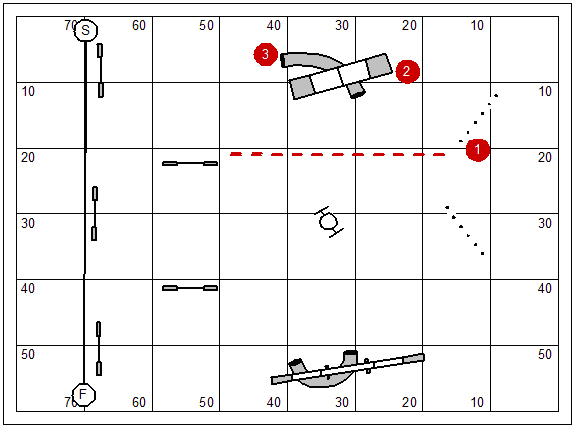 Note that the handler arrives somewhat past the wing of jump #5 because he’ll need room to move and give pressure to jump #3 (red figures) without getting very far away from jump #5 at all. 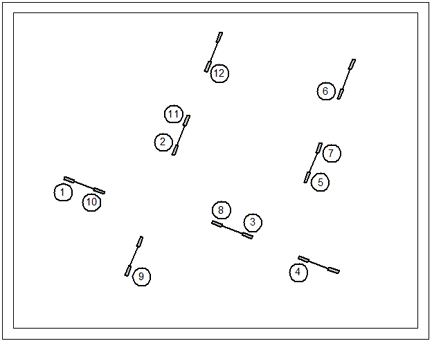 Next the handler will curl around the jump – moving parallel to the dog at a distance and draw into a Front Cross as the dog commits over jump #4 (blue figures). Now the handler draws the dog around on Post for jumps #7 through #10. The Post Turn is speed neutral, meaning that it is neither fast dog nor slow dog handling. The tricky appears to be the pinwheel. In fact it is a measurable phenomenon that the farther ahead the dog gets in a pinwheel the farther ahead the handler will be as it closes. 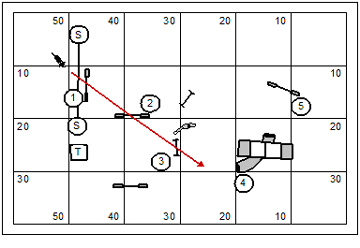 So in this drawing (red figures) the handler supports the dog’s long path with his considerably shorter path, drawing up to the landing side of jump #11 for a layered Front Cross. It should not escape your notice that solid distance skills are prerequisite to this bold slow dog handling plan. The lateral path lead-out is intuitive to the majority of dogs in our sport, though sometimes a dog’s keenness to work at a lateral distance is spoilt by early clingy training and insistence that the dog work literally in the handler’s shadow. The own the pinwheel training program for the dog is fairly critical so that the handler isn’t forced to step into the pinwheel to tap out each jump and give each bit focus in order for the dog to succeed. But these are basic distance skills. It would be nice for the handler to own an quick and elegant Front Cross as well. The Front Cross is too often in our sport a wild flapping of arms attended by misdirected movement and slow presentation of direction. One bad Front Cross in a sequence like this can spoil the whole thing if the dog’s speed is of any consequence at all. This is a four-part question. Jim Nabors starred in a popular television series on CBS in the 1960s that was a spin-off from another popular show. What was the name of the show? What was the name of the show from which it spun off? 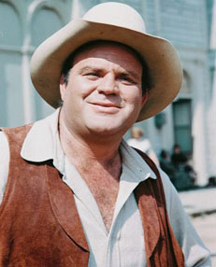 What was the name of the movie from the late 1950’s that inspired the series? Finally… who starred in that movie? The objective of this game is to run a series of numbered sequences; earning as few faults as possible. The game is scored like golf; meaning that the fewest strokes wins the game. 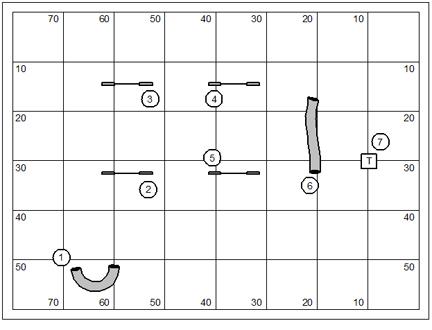 If a sequence is run without faults, then the score for the sequence is 1. 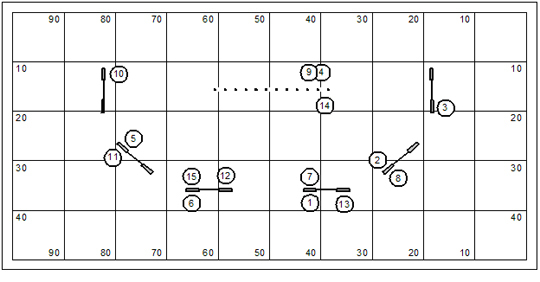 Each fault in the sequence will increase the score 1 point. Faulted weave poles must be retried until successfully completed. For any other faulted obstacle the dog must be directed to continue on course. Golf is scored points then time. Lowest number of points wins. In case of a tie, the lowest time wins. Any rules basis can be used to determine what performance constitutes a fault. This is a fine game for league play and can be integrated nicely into sequencing challenges for group classes. So… I’m home for a couple days. I’ve just returned from central IL where I led six days of seminar followed by three days of judging. Add to that two travel days… I’m pretty much exhausted. But, like the song says, there’s no rest for the wicked. Early tomorrow morning I’m off for Denver, CO for a two-day handling clinic and two days of judging. I’m home long enough to launder my clothes. The NADAC trial I judged this past weekend was a lot of fun. I have a number of observations to share about the venue; entirely positive I assure you. But right now I’m running around like a blind dog in a meat house trying to get ready to get out the door in the morning. I expect that some leisurely time sitting around in the airport will allow me to catch up with my notes. Stay tuned. What is this fellow’s name? And, with what letter of the alphabet is he uniquely associated these days? One of my favorite conventions for the design of training sequences is what I call the “There and Back Again” sequence. This is essentially a sequence that is run in one direction and then the sequence reverses itself. Oddly enough the challenges are subtly different when the direction is reversed. On my last day of seminar work for Capital K9 Training Club I put up this there and back again sequence. Mostly this is a study in solutions to the discrimination problem. I mean, that’s the big and obvious challenge in the sequence. The challenge is faced twice by dog and handler, at full speed, and in both cases with the dog’s natural flow favoring the wrong course obstacle. As it happens this sequence too gives us an opportunity to talk about the lead-out, both from the start line and from the table. This particular start line riddle is delicious to me… because this is a sequence that needs a start line stay about like a moose needs a hat rack. But you know, were all so invested in “leading out”. . . Funny thing about the table… the lead-out we’re so obsessed with at the start line isn’t so abundantly practiced on the table. More handlers will hover over the dog in a freeze-frame pose. While we’re here, hovering over the dog while the judge conducts the table count. I should point out that a poor starting position it is for the handler. So the handler turns around to face the jump, releases his dog and makes a run at it. Note that the handler has to veer to the left to get around the wing of the jump. Note too that the dog is likely to want to move in the same direction as the handler, giving the jump a miss. Here the handler is taking a bold lateral lead-out. Though note that his initial movement is not in the direction of the jump. From the lateral position the handler will establish a path forward to release the dog and apply pressure back down to jump #8. This is a wonderful way to handle the transition with a more novice dog that might need a bit of help to bring the jump into focus. 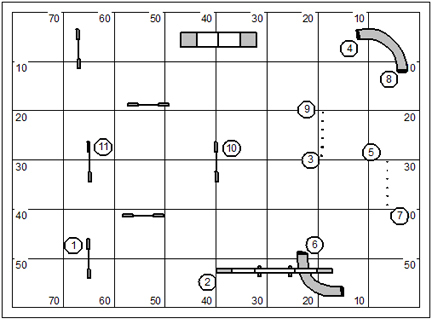 For the more advanced team the lateral lead-out is sufficient to keep the dog out over jumps #9 through #11. Note how the lateral path lead-out really allows the handler a position forward of the dog (where it’s needed) to handle the discrimination on the landing side of jump #11. After six days of seminar work I’ve begun a 3-day judging stint. I’m just plain dog tired and really looking forward to getting home. I expect after the trial on Sunday I’m going to try to make it all the way home so I can sleep in my own bed. What’s the terrible noise that is polluting the world cup soccer tournament? Please be specific. The game for the week is a standard course. That means it is a numbered course in which the judge poses an essential riddle of connecting the dots. It is my habit when teaching to always run the “entertainment round” first. That means that everyone runs a course or sequence with the handling of their own choosing. I’m not really trying to be disparaging by calling it “entertainment”. I believe fundamentally that my students will show me what they’ve learned from my teaching in their strategic attack on the riddle. Oh, I could tell them how I would do it. Frankly showing someone how to do a thing, before they can think it through on their own, isn’t good teaching. They must learn to solve the riddle on their own. And to tell you the truth if I allow everyone their own approach to solving the riddle, it give me the opportunity to learn a thing myself. A handler may do a thing that might not have occurred to me. I really won’t discard a thing that works. Instead I’ll make the appropriate mental note and then test it out. If a thing continues to work then it should become a matter of repertoire. That’s right… you heard me say it. I’m not too old to learn a new thing. So here’s the course. I’m going to set it up tomorrow in this seminar I’m leading in Springfield, IL. I’ll design a variation of it for play back home (while I’m gone, mind you). The immediate challenge at the beginning of the course has to be how to sell the dog’s commitment to the pipe tunnel at #3 and still manage to have dog on right coming out of the tunnel in order to manage the pull-through from jump #4 back to the pipe tunnel at #5. After I get the dog into the pipe tunnel at #5 it’s a nice smooth romp around two sides of the field. Mostly this is just going to be a matter of a proofing the dog’s understanding of a couple of technical obstacles… the A-frame and the weave poles when all we have to do is have at them in a fast, straightforward, and aggressive approach. This bit is followed by a simple three jump serpentine. This serpentine is a flat arrangement of jumps all on a contiguous row; and an arrangement that has haunted the agility community for an entire decade. I try to teach my students to move in and out of the jumps in the serpentine in honest handler movement. But if you think there’s a better way… well, it’s your dollar. I’ll have fun with the sequence here in Springfield. Of course I see the big obvious stuff from the onset, those things that were the intended challenges of the designer. But as often as not my teaching revolves around the unexpected and frankly basic kind of thing that rears up… the meat and potatoes of the handling game. This is the redesign for the training center at home. The field is a bit shorter because we’ve allocated the back 30′ for Beginners training. To make things fit more neatly I’m using the shorter dogwalk trainer and putting the teeter in place of the longer weave poles. The contact equipment is nearly in place already. I’m trying not to leave too much heavy lifting or moving for Marsha. She’ll of course teach classes from a breakdown format. Basically the way that works is that everyone runs the course, and then we break the course down into the challenging and interesting bits for practice and the discussion of various handling options. Given time, they’ll run the course again after the bits have been practiced. It somehow always goes smoother after practicing and smoothing through the chunks and elements. It’s a darned shame that they don’t allow us to break down courses out in the world… we’d likely be much more successful handling them. Eh? Part of the design is the desire for a bit of “feel good”. But that’s another story. What was the working title of the book Bilbo Baggins wrote? So, I’m on the road again, doing 5 days of seminar followed by 3 days of judging (NADAC). It’s a life and a routine with which I’m very familiar… with about 20 years of history. I’ve got my young boy Kory with. The routine is new to him. Today, literally, was the first time he’s been on equipment other than his own. I’m happy to report that he was quite credible as a demo dog. I’m staying in a Red Roof in Peoria. But the seminar proper is down in an inconspicuous berg called Pottstown; a blink-and-you-miss-it whistle stop that doesn’t even register as a town on my GPS. The Red Roof is packed to the gills with Bull Terriers. Apparently they have a big shindig show here in Peoria for the weekend. They’ve formally been a UKC registry but in the past couple of years have formed their own, the American Bully Kennel Club (ABKC). I’ve chatted up a couple of them and they assure me that this is a registry antithetic to breeding of fighting dogs; and they are in fact dedicated to the rescue of individual dogs and the reputation of the breed overall. Breeding bullies must be a lucrative gig for those who do it well. There were about four hummers in the parking lot. I also spied license plates from Maine to Minnesota to Texas. So this must have been an important shindig for them. My only real complaint is that they’re only slightly better than AKC breed competitors in the fine art of picking up dog poop. That means, of course, that only about half of them clean up after their dogs. I’m pretty darned tired. The night before I left I stayed up til near midnight getting the Jokers Notebook #5 (June, 2010) finished and published. It’s really a lot of work. I have more than 100 pages that go into every issue, And then, of course, I kind of geek out on the product. 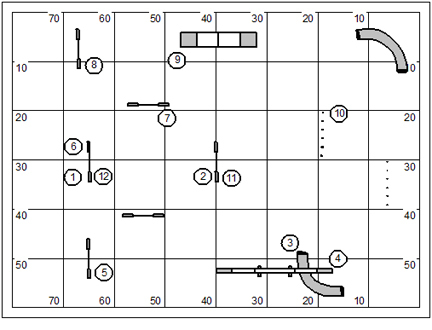 I still insist on allowing the reader of the ebook to click on the upper right corner of any course map and immediately spwn it into the Clean Run Course Designer. That’s a meticulous piece of design work, don’t you know. Last night I didn’t sleep so well either. I stayed up doing a bit of work. I woke up and took a peak at the clock this morning and about had a panic attack as I read the time as 9:11… ish. I immediately surmised that I’d missed my 6:00 am wakeup call and jumped out of bed like I was afire. After a couple minutes of grabbing stuff to make a hasty exit I realized that it was only just after 5:00 am and my bleary eyes had just misread the clock. Of course I couldn’t go back to bed. But at least I managed to turn more leisurely in my preparations. We worked inside today. It was very hot and very humid outside, and thunderstorm soakers rolled through two or three times. We were all tickled pink about not being outside in the weather. It was a very nice group I worked with. There were, I think, 12 working spots and an auditor or two. And, there wasn’t a Border Collie in the bunch. If I have mellowed over the years as a presenter, it is on this point… the handler should approach any handling riddle by doing what is right for that dog. I find myself completely opposed to the idea that there is any one-size-fits-all solution to any handling riddle. This is an adaptation of a handling drill I first saw Stuart Mah teaching something on the order of 20 years ago. He called it the “oscillation exercise”. This was one of maybe three exercises we did in our work today. I think that this is going to become one of the foundation drills I do in the Jokers Notebook some time in the next month. While it’s simple in concept, there’s nothing really easy about it. 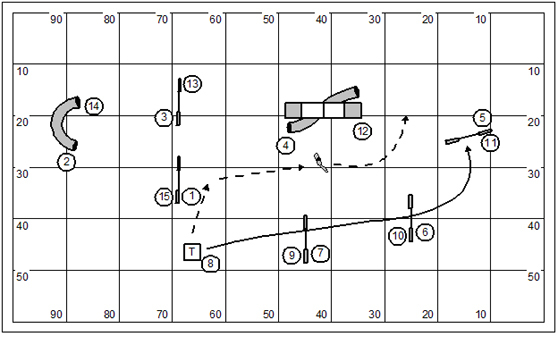 We found at least three prominent strategies that emerged from our work based on the type of dog in the drill. Okay, like I said, the Joker’s Notebook for June 2010 has been published. Our price: $10.00. 111 pp. Where is the “Scorching Wind Desert”? Questions comments & impassioned speeches to Bud Houston: BudHouston@hughes.net. 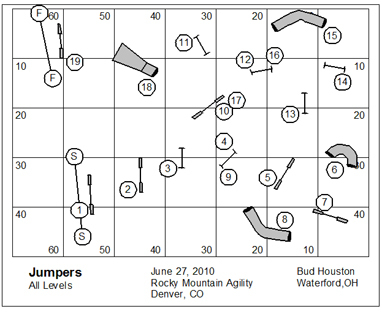 Check out my latest publication the Jokers Notebook ~ Dog Agility Distance Training Plan – June 2010 available on the Country Dream Web Store: http://countrydream.wordpress.com/web-store/ . I’ve named this game in homage to the “Wild Weavers” an agility franchise in central Ohio that burst onto the scene about six or seven years ago and is now winking from existence as those who ran the franchise are shying away from public classes in order to pursue other opportunity. Their students will scatter and find new homes; and all will be right in the world. Wild Weavers is scored Points then Time. Jumps are worth 1 point and the weave poles are worth 1 point for each pole if the handler is between the curl of jumps and the weave poles; or worth 2 points for each pole if the handler is on the outside of the curl of jumps while the dog weaves away. So… a complete set of weave poles is worth 12 points if the handler is inside; and 24 points if the handler is outside. 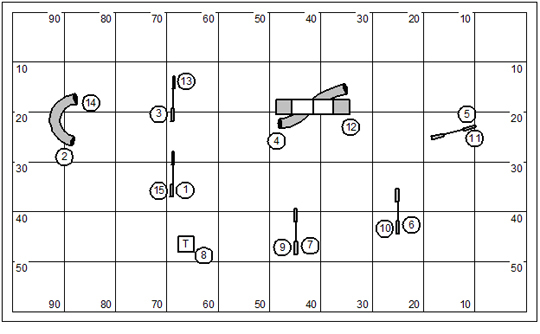 Scoring does not end after the completion of the 15 obstacle set; instead the handler should direct the dog to begin again. And so the dog and handler continue to work the sequence until the whistle marks the end of scoring. To stop time the dog must be directed over the #15 jump (in either direction). The dog will be awarded the points for his greatest forward progress through the weave poles should the time whistle sound while he is engaged in a performance of the weave poles. If a dog drops the bar on a jump he will not earn the point for that jump and may not earn a point for that jump on subsequent performances. However, the dog must be directed to go between the standards (complete the jump) on each successive numbered occurrence of that jump. If a dog goes wrong course there is no fault. However the dog may not earn new points until he resumes the correct course. There are no specific faults in the weave poles. However if the dog misses the entry or pops out of the poles at any time he must be directed back to the beginning of the weave poles to resume the performance. However, the dog will be awarded the points for his greatest forward progress through the weave poles should the time whistle sound while he is engaged in a performance of the weave poles. The dog is required to earn 48 points to qualify. 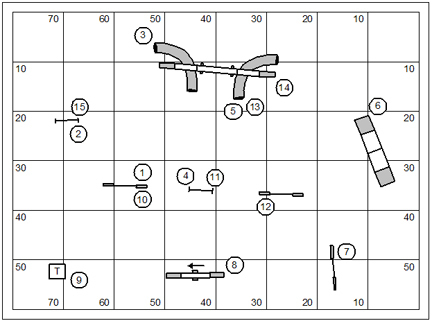 This game is truly a variation of “Time and Score”; a game invented by Kenneth Tatsch and Jean MacKenzie in the early 1990s after they returned from an agility trip to the U.K. By evolution we suspect that Time and Score was nudged aside by another game invested in speed and foundation training for technical obstacles… the Steeplechase. You’ll note that it’s possible to qualify without earning the bonus points for distance handling. We’ll leave the bonuses to the bold and the brave and those who want to distinguish themselves by higher placement. In the study of English grammar “Absolute” and “Relative” are types of a part of speech. To what part of speech do they refer? And, what are the other types of this part of speech? You are currently browsing the Bud Houston's Blog blog archives for June, 2010.